In honor of my son going to the South for two years, I made a Mississippi Mud Cake. 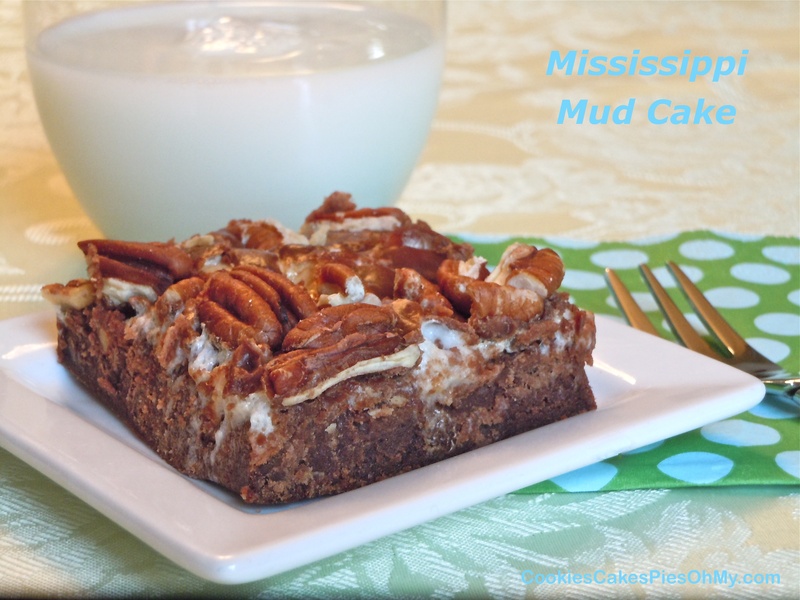 It is a brownie like cake with marshmallows, frosting and pecans, really delicious and makes a lot. From Southern Living. Preheat oven to 350°. In large bowl in microwave or large saucepan, melt butter and chocolate chips together. By hand, beat in sugar, eggs, vanilla, flour, cocoa, and salt. Pour batter into greased 15″x10″x1″ (jelly roll) pan. Bake 20 minutes, remove from oven and sprinkle mini marshmallow evenly over cake. Bake 8-10 minutes more or until golden. Drizzle chocolate frosting over warm cake and sprinkle with chopped pecans.